Floor steam cleaners are your best friend for cleaning your floors when a steam mop just won’t cut it. 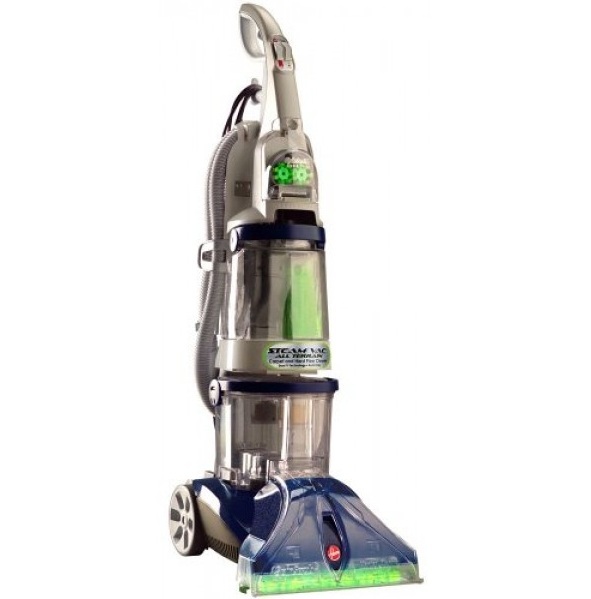 Floor steam cleaners pack more power, and have versatile features that clean carpets, wood, and tiles with ease. As you’ll see, there are lots of crossover options that combine vacuums, carpet cleaners, steam mops, and more. There’s a huge variety of machines on the market, and they all have their own strengths and weaknesses. A lot of them appear to be great, but how do you separate the good ones from the gimmicks? No worries–we’re here to help! We looked at lots of steam floor cleaners to find the ones that are really worth your money. We found three great machines that will help you clean all your floors with the power of heat and water! Our choices are all hybrids, and are all built to handle multiple surfaces. We looked for versatility, durability, user-friendliness and most importantly, cleaning power! The Symphony is a vacuum/steam mop hybrid. It’s a quick, simple way to get your prep work and deep cleaning done in one swoop! Plus, it doesn’t cost much more than a regular steam mop. Not only does it double as a steam mop and vacuum cleaner, but it can do double duty at the same time! This machine uses a combined cleaning head with a vacuum in front, and a steam mop in back. Having the vacuum in front is an advantage for a few reasons. It preserves the mop cloths, since they don’t have to deal with any loose dirt. You’ll get longer life out of them, and longer cleaning time with each use, maximizing your dollars spent. Plus, it cuts out a step in the cleaning process. What’s not to like about that? You don’t have to haul out a bulky full-size vacuum to prep your floors before retracing your steps all over again with the mop. You can just vacuum, just mop, or turn on both for full cleaning power! You can control the cleaning settings straight from the handle, and switch over immediately. The Symphony keeps a reserve of steam at the ready, for whenever you need it. The tanks are separate, so you won’t have to worry about moisture getting involved in the vacuum system. Likewise, the mop goes behind the vacuum, so it’s free of any loose dirt or debris. Both tanks detach for emptying and refilling. The dust cup empties with the touch of a button, so you never have to touch the dirt inside. It also includes a filling cup for the water tank, so things don’t overflow and make a mess. It comes with two types of mop pads–soft and cushioned, and scrubbing. And you get two of each, so you can cycle them through the laundry. All of the mop pads are treated with Microban anti-bacterial coatings. This prevents any residual germs or other nasties from growing on the pads before and in the wash. The mop pads switch out with a really neat system. By hitting a footswitch, you release a tray which drops out of the machine. Then you just slide the new pad over the tray, without having to fiddle with the vacuum parts. And there aren’t any fiddly clips or holders to break (which is one of our pet peeves on other mops!). Lots of convenient features like this really set the Symphony apart for us. Its adjustable handle, easy-empty dust cup, and separate cleaning settings make it easy to use, and take a lot of the hassle out of cleaning floors. There are two steam settings, high and low. This allows you to handle different floors as well as different levels of mess. It comes with a 2-year limited warranty. It’s not good at edge cleaning, since the vacuum portion is only along the front. You’ll still have to use a traditional vacuum with a wand for cleaning baseboards and corners. The vacuum isn’t super powerful, so it can’t draw things in over much distance. It doesn’t work on carpets or rugs. The steam mop isn’t really equipped for deep grout. While there’s a high steam setting, it doesn’t have a scrubber brush for getting down into crevices. We recommend the Symphony if your home has wood floors, linoleum, or fairly level tile. This Deluxe Canister set is the top of the line offering from McCullough. It combines a super powerful steam engine with a full set of attachments for dealing with all your floors, from hardwoods to concrete. We love it because it not only steam mops with incredible power, but is also versatile enough to clean the rest of your house. The floor head is incredibly versatile. It’s equipped with heavy-duty scrubber brushes, which you can cover with extra-large mop cloths for use as a steam mop on pretty much any flooring. The brushes are great for concrete, whether in the garage or on the walk. The mop pads are ideal for hardwood floors and more delicate tiles. At 13” x 8.5”, the floor head provides more coverage than traditional steam mops. The 64 oz. water tank provides up to 2 hours of steam power, and the vapor is pressurized at 48 psi. The Deluxe set comes with an incredible 23 different attachments and accessories–more than any set we looked at. We also love that they can all be stored onboard. This makes up for the bulk of the canister. The narrow “pen” wand is one of the best attachments. Previous buyers said it works on just about everything, producing a narrow, intense jet of steam. It’s great for blasting grout without having to scrub as hard. It also cleans very well in corners and around bathroom fittings for cleaning hard water deposits and other gunk. For floor cleaning, you can use any one of the wand attachments to spot-treat carpet stains. After a minute of steaming, you can wipe stains up with an ordinary towel. The window attachment is wider than the attachments that come with handhelds and other steam cleaners, and comes with a squeegee. There’s also a scraper attachment, and users said it works wonders on old wallpaper. It’s also great for getting dried paint off walls and floors, if you need to clean up after painting or remodeling. Unlike weaker systems, this one has the power to blast old paper off the walls. It’s one of very few home steam cleaners with the power to really use the attachments to their fullest extent. Even though it’s powerful, it’s user-friendly. The handle is adjustable and ergonomic. Steam power is adjustable right from the handle. That’s a big step up over its little brother, the McCullough 1275. Adjustable steam makes this machine a lot safer for your hardwoods. The power cord is 18 feet, so you’ll have plenty of reach, even without a long attachment. Customer support is based in Kansas, not overseas. That’s a big plus for us, since steam cleaners can be very temperamental. You want to be well taken care of! It’s pretty bulky. Since it takes awhile to set up and take down, it’s pretty inconvenient for small jobs. The warranty is only for 1 year. For such a large, expensive steam cleaner, we think that’s pretty short. You’ll find longer warranties on many steam mops. The power switch is a weak point. Several online reviewers said theirs gave out rather quickly. That’s obviously a fatal flaw. While it’s covered under the warranty, we would urge extra caution with this part. Reliable’s EnviroMate Brio is a very capable midrange canister system that’s ideal for cleaning all sorts of flooring. It’s got a much better track record for long-term performance than the McCullough. We think it’s both better-designed and better-executed, with excellent build quality and functionality for its price range. One of the best things about the Brio is that it’s one of the only high-quality canister systems that’s both compact and lightweight. While the Ladybug below is far from bulky, it’s pretty substantial! The Brio is a nice middle ground between something compact but cheap like the McCullough and something rock-solid but bigger like the Ladybug below. This one has much better build quality and power than the McCullough, without being so much of a commitment as the Ladybug. It still costs well under $500, but it has high-quality parts that should last for years, plus a much more powerful boiler. We think it makes the perfect canister system for the average person. Cleaning with the Brio is a joy, if not quite as effortless as with the Ladybug. The Brio produces 245-degree dry steam at 58 psi. That’s both hotter and more pressurized than the McCullough’s output! We think the Reliable should easily be able to handle anything you throw at it. It heats in 5 minutes, so setting up isn’t a hassle at all. As you can see, it doesn’t lack for accessories! The floor tool is especially good, since it provides steam coverage right to the edges. You can work quickly with this! The pad is nice and thick, too. It protects all your finishes. It’s also nice to have adjustable steam settings for different applications! That’s something you also get on the McCullough, but the Reliable gives you a lot more control. We’ve already mentioned that this is a much sturdier system than the McCullough. In fact, we think it’s the best-made system under $1000! Considering that the Brio costs just a fraction of that, it’s high praise. The Reliable has a double-walled aluminum boiler and solid, rugged parts. It’s noticeably superior to the McCullough, despite the fact that that model is American-made and this one’s imported from China. Everything about this system is ergonomic and well-designed. It offers a 25-foot reach, when you use both extension hoses. It’s well-balanced, the canister follows easily, and it doesn’t wreck your wrists. Our favorite design perk is the fact that the steam wand fits into the canister unit. Once you’ve done that, the whole thing is easy to pick up with one hand! We expect this to last as long as Reliable’s other products, which is to say a long time! It’s covered by a 1-year warranty on everything, plus lifetime coverage on the boiler. It’s at least 50% more expensive than the McCullough, depending on sales and such. It’s not the absolute best thing. The Ladybug system below reaches higher temps, and has a lot of user-friendly features that make it more enjoyable to use for folks who are passionate about steam cleaning. For instance, that model allows for continuous refilling. The Reliable is probably as much as the average buyer needs to spend, though. Ladybug steam cleaners are unquestionably the best on the market, if you want ultimate power and versatility. They get hotter than anything else we’ve reviewed, and are head-and-shoulders better than Reliable’s Brio, which we think is the next best thing. While many Ladybug systems are prohibitively expensive, this one’s priced about the same as a premium canister vacuum. We think it’s the ultimate floor cleaning tool! It’s also something you’ll find many more uses for around your place. It’s a lot more affordable than other Ladybug systems. 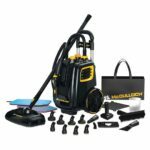 This Italian company makes a whole range of high-end steam cleaners, but most of them are extremely expensive (costing $2K+). That’s why we don’t feature more of them in our reviews! We know that they’re simply out of reach for most people. This one doesn’t cost much more than the best canister vacuums, though. We think it’s a reasonable buy for someone who’s committed to using steam all over the house! The Ladybug gives you the same working range as the Reliable, between the generous power cord and the two hose extensions. You ought to be able to reach absolutely everywhere you can think to use it! One of the differences you’ll notice immediately the first time you use a Ladybug is how much more powerful they are than other canister systems. Don’t get us wrong–we love the Reliable, and we’ve got a lot of respect for the McCullough within its price range. There’s simply no comparison between those two systems and the Ladybug, though! For one thing, the Ladybug produces much hotter steam. It’s also delivered at a higher pressure! This boiler hits 290 degrees, and steam comes out at 58 psi! Those are just specs, of course, but you’ll find that they make a world of difference. The Ladybug cleans more intensely on any surface, and basically dissolves messes on contact! Since it’s so powerful, you can blast through your floor cleaning tasks very quickly. This system works much more efficiently than others, so you’ll find that you can pack more projects into your weekly cleaning without getting overwhelmed! It’s really great for sticky kitchen messes, especially things like the hood or cabinetry where you have to get greasy messes off without using too much moisture and making a mess. We noted in our review of the Reliable that its ultra-hot steam dries very quickly. That’s even more the case with the Ladybug! It leaves very, very little moisture behind. It’s ideal for folks with allergies, since you can kill dust mites in soft furnishings without creating mildew in the process. Having such hot steam also means that the Ladybug sanitizes without you having to stay on one spot for an impractically long time. For comparison, most steam mops require you to hover for 15 seconds to sanitize, if they even get hot enough to sanitize in the first place. This one does the trick almost instantly. Continuous fill makes Ladybug’s by far the most convenient canister systems to use. It takes slightly longer to heat than the Reliable (mostly due to the larger tank), but once it’s up to temp, you can top it up without having to start from empty and wait for another 10 minutes. You can top up and keep right on steaming! There are a lot of other conveniences which make this one feel like the premium system it is. There are fingertip controls on the wand for the steam output, and the machine lets you know with a light and a warning noise when you’re low on water. Like our other recommendations, the Ladybug is equipped to handle much more than your floors! It comes standard with 13 accessories, and is available in a few different packages (just follow the links to see your options!). We love that it also comes with an excellent manual and instructional DVD! Most people are relatively new to steam cleaning, but the Europeans have been on the steam train for years. This DVD shows you all sorts of uses for your Ladybug that you probably wouldn’t think of on your own. Like the Reliable, the Ladybug follows easily and is impressively ergonomic for a larger machine. It has a big handle built into the top of the canister, making it easy to bring up and down stairs. It also has a splash-proof design to keep your hands safe–something we always appreciate! It’s made in Italy with impeccable build quality. Just ask previous buyers–these things last forever! It’s bigger than the Reliable. You definitely need some closet space to devote to your Ladybug when you’re not using it. It’s a bit heavy. Without water, it’s over 15 pounds. It’s expensive, even if it’s a budget Ladybug. This one only makes sense for someone who prefers to do nearly all their weekly cleaning using steam. If you’re only going to clean one or two rooms occasionally, you shouldn’t be spending this much. Which steam cleaner is right for your floors? The Bissell Symphony is your best bet for dealing with most hard floors on a budget. It’s gentle enough to preserve and enhance the finish on your wood floors, and has enough steam and scrubbing power to handle most tile floors. However, it’s not ideal for deeper grout. (Read more on this Guide to Hardwood Flooring). The lack of attachments also make it a bit limited. If you have deep grout, or simply want more versatility, the McCullough has a lot more power than the Bissell. It can blast down deep into cracks, and has a decent set attachments for dealing with whatever cracks and crevices are in your way. We suggest it for an all-purpose steam cleaner on a budget. Still, you do make some sacrifices for the McCullough’s low price tag. It’s not as powerful or well-designed as the Reliable or the Ladybug. The Reliable Brio is our midrange pick for a canister-type steam cleaner. Think of it as a smarter, sleeker version of the McCullough. The Brio is also far more reliable than the cheaper McCullough. It’s our recommendation to the average buyer who wants to clean floors thoroughly and have some extra general-purpose capabilities! The Ladybug is our ultimate recommendation for cleaning floors. It leaves the least residual moisture and the continuous steam feature makes it the most enjoyable to use on long cleans. It’s also the absolute best thing for sanitizing and dealing with allergies. Of course, it’s overkill if floors will be the only thing on your list to clean. Still, assuming you don’t have an inhuman ability to keep the rest of your place spotless, we guarantee you’ll find uses for this all over the house. If you have a lot of carpet, the Hoover model recommended below is beyond capable. It’s a step above many other carpet cleaners, since it has an onboard heating system. Plus, it’s versatile enough to use on your other floors. While it’s a bit of a hassle to set it up just for regular cleaning, it’s an easy way to get all your floors deep cleaned at once when you need to do so. This machine finds the middle ground between a carpet cleaner and a steam mop for hot water cleaning on any hard or carpeted floor! Price at around $230 at the time of writing, it’s recommended by Consumer Reports, and is very popular with online buyers. We love it for its scrubbing power, as well as its handy onboard heater. There’s an onboard heater to make sure your water stays hot. While this isn’t a steam cleaner per se, it uses very hot water to have much the same effect. It dissolves sticky spots, and blasts grime out of crevices. Because the machine uses hot water and not steam, it deep cleans carpet more effectively, getting hot soapy water right down to the base of the carpet fibers. And it still packs enough heat to dissolve dirt and stains on hard floors. The brush head uses many circular brushes instead of a large brush roll. They scrub in many directions, rather than just one. That means they do a better job on carpet fibers, and provide more friction and scrubbing power to really work detergent into your carpets. They’re also great for working into tile grout. The auto-rinse feature makes sure any soap is sucked up on the return pass. There’s a handy switch which changes from soapy water to hot rinse, so you can clean as needed. The suction system channels soapy water, rinse water, and hot air across the whole nozzle. It’s designed to clean, rinse and dry right to the edges of your floors. The wheels are outfitted with little rubber tires, to protect your hardwood floors. In addition, the spray nozzle cover pops up for adjustments or untangling stray carpet fibers or pet hair. With an 8-foot attachment hose and a 20-foot power cord, you have plenty of range. There are two attachment heads. One is a Spin Scrub brush which can be used in the bathroom, on windows, or other flat surfaces. We love it for cleaning wall grout, as well as shower soap scum. The other is an upholstery brush, for furniture and carpeted stairs. It’s also very effective for tough stain spots, as you can zero in on the problem without getting the rest of your carpet too wet. It’s prone to leakage, especially when you’re changing the tanks. You’ll want to do a leak test when you get it, to make sure your unit doesn’t have any problems. We also found that a lot of leak problems can be easily solved by making sure everything’s aligned before you start cleaning. One annoying design flaw is that the squeegee isn’t held in place. It slides into a slot in the plastic body, but there’s no catch or latch to keep it in. Some reviewers found that it slipped loose while they were cleaning. You’ll have to wipe up a bit of water on hard floors. While the Hoover does a pretty good job cleaning up after itself, there’s usually a bit of sludge left behind. It’s a good idea to have a towel handy. This might seem like a lot of work, but remember that it takes care of all the scrubbing for you! Hoover’s customer service has a poor reputation. We’d recommend double-checking everything in the return window with the vendor, before dealing with Hoover. Do you have mostly tile, wood, or carpeted floors? Are you looking to clean all of them with one device? Are you looking to supplement your steam mop, vacuum or carpet cleaner? These are questions you’ll want to answer. Thinking about what floors you’ll be cleaning will narrow down your search. For this page, we chose dedicated floor cleaners. However, a floor cleaner can clean more than your floors, as you’ve seen from the McCullough and the Hoover. If you want a versatile machine, look for appropriate attachments and adjustable steam. Floor steam cleaners generally cost between $100-$200, depending on whether you’re looking at a carpet cleaner, steam mop, or canister steam cleaner. The best floor cleaners are some combination of the three. Thankfully, these hybrids don’t cost much more than an ordinary steam mop or canister steam cleaner. Steam mops are a bit cheaper than a full steam cleaner. 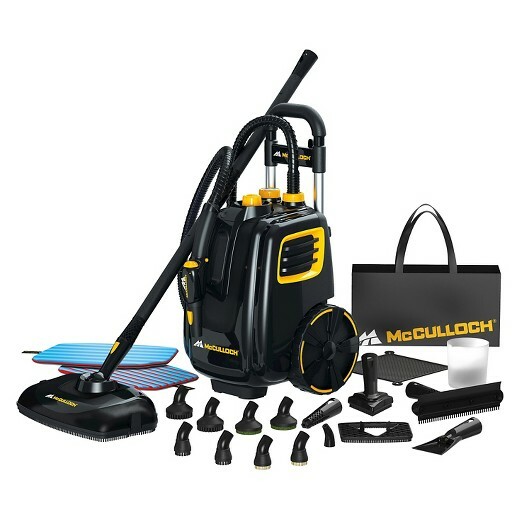 However, a canister cleaning system like the McCullough can cover lots of cleaning needs for the price of one machine. That can be a smart investment, if you’re going to make good use of it! To have a look at steam cleaners for your whole house, check out our guide to the best steam mops! If you’re looking to add steam to your light cleaning arsenal, try a handheld steamer! We’ve reviewed the options and brought you the best models here.